To add flexibility to our range of spacesaver staircases, we are able to offer a bespoke 90° turn landing on the entire range of spacesaver staircases. The staircase may turn to the left or right and the landing may be placed at virtually any point on the staircase to fit your requirements. To request a quotation for a spacesaver staircase with a 90° turn, navigate to one of our standard spacesaver staircases using the links on the left and use the enquiry form at the bottom of the page. Alternatively, you can give one of our sales advisors a call on 01952 6208853, to place an order, for a quotation or further advice. Most of our spacesaver staircases can also be supplied with carpet inserts recessed into the treads during production as an optional extra. 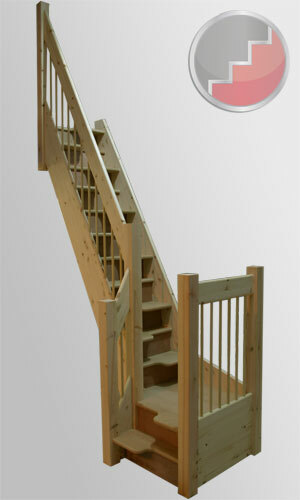 The availability of carpet inserts on particular staircase models is shown on the relevant staircase page linked via the left hand panel.